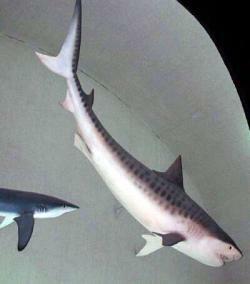 In Treason's Harbor, the Captain and the Doctor and their crew have a bad experience, when they lose a passenger to a tiger shark (Galeocerdo cuvier, length up to 20 feet). This is one of the most dangerous sharks in tropical waters, a proven man-eater. It is also known as "the garbage can with fins", as it will eat anything: tires, bags, animals, carrion, etc. Their common name comes from their obvious stripes. Another fish/man meeting in Treason's Harbor, this time a pleasant encounter with the Doctor, is with the whale shark (Rhinodon typus, aver. length 40 ft.). When the Doctor is under the Red Sea in a diving bell, he gets to observe closely a whale shark swimming nearby. This is a common experience today, but now the scuba divers have enough mobility to swim along with the sharks. Whale sharks are filter feeders, slowly filtering microscopic animals out of the water as they swim with their mouth open. As the water passes through the mouth and out the gills, spongy organs strain it, which collect the food. They are completely non-aggressive, but their skin is very rough, so people who want to touch them should wear gloves.